Rustic Candied Sweet Potatoes & Apples is the perfect recipe that will please all palates. Don’t you just love sweet potatoes? Add apples and you have the perfect side dish. Not only is this recipe delicious, but it looks amazing too. I found this recipe in the Christmas with Southern Living Cookbook. The original recipe called for double the amount of sauce. I found that it was way too much sauce, so I cut the ingredients in half. Heat water to boiling. Cut peeled sweet potatoes in half and add to the pot. Cook for 10 minutes and then let cool down enough to handle. Meanwhile, core apples and slice into 1/2″ rings. Once sweet potatoes are cooled down, slice in 1/2″ rings also. Melt butter in saucepan and add brown sugar, apple cider and salt. Cook for 5-8 minutes, until sauce thickens. Add vanilla and remain from heat. 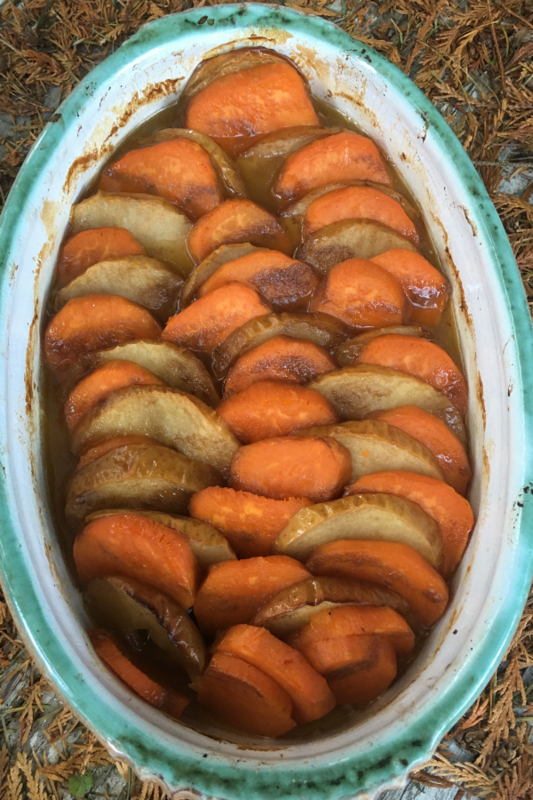 Layer sweet potato and apple slices in a greased 9″ x 13″ baking dish. Pour cooked glaze evenly over sweet potato and apple slices. Bake uncovered for one hour. After 30 minutes, bast glaze and return to oven for 30 more minutes. This baking dish is 9″ x 13″ and can be found here. Find out how having the right potato peeler can make your life so much easier. You can find the OXO Good Grips Peeler here. Make sure you subscribe so you don’t miss a post. You wouldn’t want to miss other recipes like The Most Delicious Meatloaf Ever or To-Die-For Rustic Hungarian Mushroom Soup.